JNN 08 June 2014 Karachi : The Terrorism , Injustices and the Oppression against the Pakistani Shia community has given birth to the The Shia Media which is in its Infancy stage in Pakistan , But the Government is so Much afraid of it that it is Banning and Putting it behind Closed Doors . 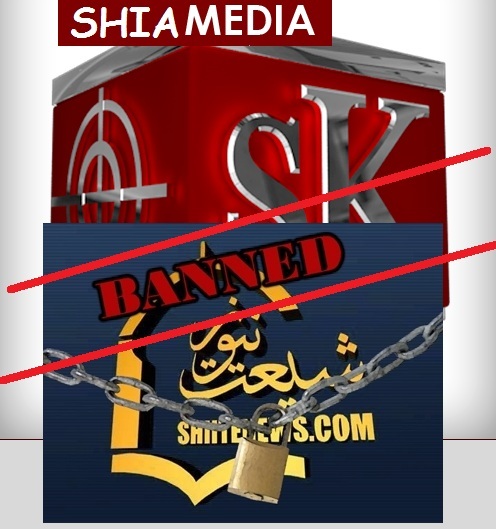 The Latest of Such events is the Banning of the Shia News Website “ www.shiitenews.com “ and its allied Face Book Page even , this is in line with the earlier similar attempts , in which , as even earlier “ www.shiakilling.com ” , was also banned from viewing within Pakistan By Pakistan Telecommunication Association , Under the Pretext of “ Undesireable Content ” . We Like to remind our subscribers , that the Present Govt is the same , which is the Same Champion of Freedom of Speech and access to the News when it comes to the Circle of their Loyal Friends and Defenders of their Sponsors ,which are the Saudi and the US Govts. , as in the Present Scenario of Geo News , they have given their statements that they are the Torch Bearer of Freedom of Speech , and uptil to this Height that , If the GEO NEWS , who on Air for atleast 8 Hours of its transmission , Kept on accusing the DG ISI , in the attack on one of its Most Loyal Anchor Hamid Mir , without of having any Proofs or any Documented Evidence , and still , they support the News Group , in the Name of Freedom of Speech , as Dictated by their Saudi and US Masters that they didn’t want to Ban it completely . Rather they Insist that their Hidden apologies should be accepted , and they have resisted and even Let down the appeal from the Armed forces of Pakistan to Ban the Group , and to Punish , which is even Protected in the Constitution of Pakistan. And this is not the End , as even the Pakistani Successive Govt and the So Called Main Stream Print as well as Electronic Media Groups , who claims to be defenders of Freedom of Speech , Expression and access to News have their Lips sealed on the same Issue ,when it comes to the same Bans and the Shia Media , which is raising the voice against the Oppression and Terrorism , and Injustice against the Shia Community of Pakistan. ON the Other Hand the same So called Free Media , Rather Foreign Sponsored Media Give their Prime time to the Hate Mongers and the People who Advocate Sectarianism , and The Group Head of the Banned Organisations, Like Sipah e Sahaba Pakistan , and even the Terrorist Groups are been given the Prime Time on Air by the Media Houses , who are Part and Parcel of this Infested Terrorism in Pakistan , But at the same time No Authority or Regulatory Body takes any action against them . Hamid Mir the Renowned Columnist and the TV Anchor is the same Person , who had the Privilege to Interview Osama Bin Laden , in the Remote area of Undisclosed Location , who was wanted by the US and the World Intelligence Agencies , but even after they being well equipped and well trained for the Job , to Hunt Down Osama Bin Laden , who was Wanted Dead or Alive , but Unfortunately they could not reach him , but the Great Hamid Mir , can go to his Private Bunker and Interview him , and come safe and victorious . And No Question is being asked with him , that how did he manage to reach the Most Wanted terrorist of the World , and even after his Interview , he Lived in Peace for Years , but still he could not be traced by the Intelligence agencies of the World , who was in the Reach of the Pakistani Media Group , Anchor . But the Action is only being taken one sided against the Shia Community Media , which is even on very small scale , but as it is being giving the facts and figures of the Injustices of the Govt, and the show the real face of the Govt , who can control this terrorism , if concrete steps are taken against the terrorism and the sponsors of the terrorism, but rather is unwilling to control , and as this So called very small shia Media is trying to uncover these facts , therefore they are being Penalized for showing the real face of the government , which is nurturing terrorists and terrorism , on the orders of their Foreign Sponsors. But People in the Power Corridors should not forget the The History as it has a Big list of events , when the Injustices of the Rulers has crossed the Limit , the Revolutions has taken over By Default , and the same Rulers are now remembered as the Traitors of the Nation , and the Dictators ,who have Looted the Public Money and Resources , have gone down the Drain , whether it was the French Revolution , the Latest Irani Revolution , or the Iraqi Revolution. And at the same time we would also request our Dedicated subscribers and especially the Shia Community Members , that they should even Play their due role in supporting to Raise your Voice in their support , standing with them in the Hour of Need , and even supporting financially ,these Shia Media Groups and Organisations , as it is their Social as well as their Religious Duty to support the teams working in the Back Ground, as they Not only Risk their Lives and Valuable Belongings but also face Many other hardships to Keep the Community well aware of the Hidden Dangers , Sorrows , Current Affairs , and things that may shape up their Lives in the coming days. As they are their ears and Mouth to communicate their sufferings and to claim their Due Role in the Society , as if they are wiped out the whole community will be in a complete Black Out , and finding the Right Path in the Dark is not Only Dangerous , but in some cases it is as Good as a Suicide. This entry was posted in Jafria, Pakistan News and tagged Banned, pakistan, Shia Killing Banned, Shia Media, shiite News Banned. Bookmark the permalink.